Jessica Pearson has left the building. 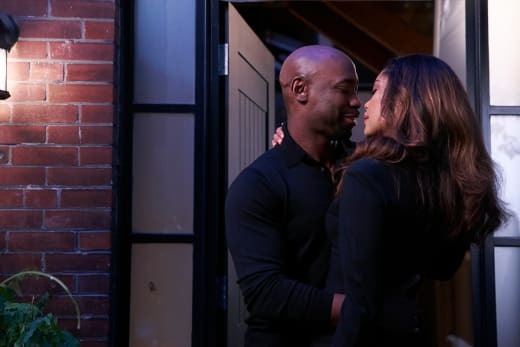 Suits Season 6 Episode 10 served as Gina Torres' final episode with the USA Network hit, but it was difficult to feel much emotion in the exit of this pivotal character. It's been clear for quite some time now that Jessica would be moving on. All it took was saving Leonard Bailey's life to make her realize it. The flashbacks were a nice touch and went a long way to show us just how Jessica has always fought for what she believes in and the show will never be the same without her. It seems like the reason she sent Harvey and Louis to try and save the firm was because she wanted to know if the firm was safe in their hands. It was. 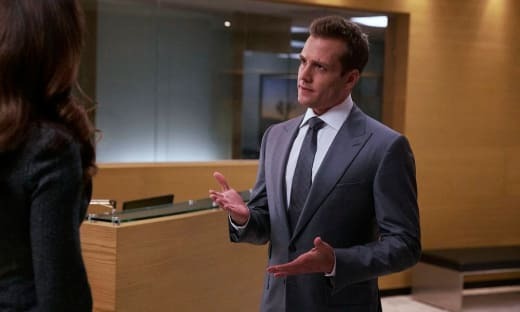 Sure, there were some hurdles along the away, as all of the drama with Sutter had a halo effect that ran through what was left of Pearson Specter Litt. It came as absolutely no surprise that Sutter would do something in the aftermath of the events of Suits Season 6 Episode 9. It's not every day your very own lawyer turns on you, so he chose to fight back pretty quickly. Harvey struggled to go to the board meetings because he has become so accustomed to Jessica dealing with all of the firm-saving shenanigans. Yes, Jessica is that person who can talk anyone around to her way of thinking. I'd like to say it's unfortunate that Harvey managed to have his wits about him to save what was left of the firm, but he pulled it off. It seemed like this big, impossible task, but things went his way. Louis bringing Stu in helped big time, but it was somewhat surprising that he would even speak to Louis ever again after his reaction to the news that he would be vacating the office. Say what you want about Louis, but he has forged a great friendship with Stu over the course of Suits Season 6. It's just a shame the writers are dragging his character down by rolling full steam ahead with the Tara plot. Carly Pope is a great actress, but her character just isn't gelling. Maybe it's the fact that we only ever get to see her with Louis. It wouldn't hurt to give her a sub plot of her own to help us get to know her a bit better. With Louis proposing to her, it seems like she will be sticking around, but I can't fathom whether Louis genuinely likes her or if he's just desperate. Things have moved a little too quickly for my liking, and I'm scared in case it all ends in tears for him. How would he be able to recover from another failed relationship? Raising another dude's kid is going to come with its fair share of drama, but hopefully we get to see some more layers to the character of Tara. It's difficult to care for a character we know so little about. Elsewhere, Mike adjusted to being a free man, but it didn't stop him from trying to help Rachel win Leonard Bailey's freedom. Harvey's offer was a nice one, but Mike should steer clear of the firm. If it has any hope of making it through this tough time, he should be well away from it. How do the others really expect anyone to do business with a convicted felon? All of this just seems poised to get tougher. 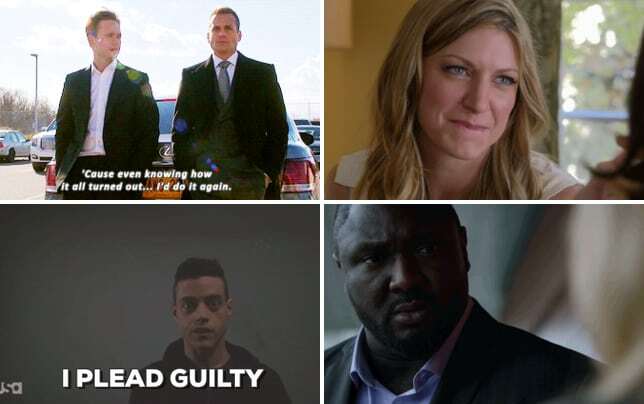 There are some turbulent times ahead for all of the characters that remain with the show. "P.S.L" was a decent episode of this hit drama series. It's great the show is still embracing change after six years on the air. It genuinely feels like we are going into the home stretch of episodes, but we still have a full season to go. Robert's offer a good gesture, but I'm glad Jessica stuck to her guns and didn't take it. Where the heck is Gretchen? She disappears for weeks on end. Can no one mention Sutter's name ever again? I'm So over him. Can Rachel please get storylines that don't involve Mike? She's been great this season! Remember you can watch Suits online right here on TV Fanatic. Get caught up on all the drama now! 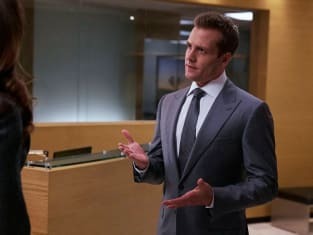 Suits Finale Review: Who Left for Good?! ?